The design of the Levoit LV-H132 is simple, intuitive, and compact. It has a glossy white body with air vents around the base of the unit and a powerful 3-speed fan (with built-in nightlight) at the top. All of the features of the Levoit LV-H132 are accessible through touch controls around the top of the purifier. The Levoit LV-H132 is designed with a three-stage filtration system for capturing a wide range of particulate. Activated carbon filter: This filter is designed to capture odors like food, smoke, pets, and more. Carbon filters work by absorbing offensive odor molecules into the carbon filter and neutralizing them. The Levoit LV-H132 is a compact air purifier, considering other models on the market with comparable performance. It is small enough to sit comfortably on the floor or on a countertop or table. For the best performance, you’ll just need to make sure that you can maintain a 15” clear area around all sides of the air purifier. The Levoit LV-H132 can be a great option for purifying smaller room, but you may not have the same results with larger room types. Likely due to its smaller size and affordable price point, the LV-H132 is only designed to treat about 86 square feet of cleanable area. RELATED – What’s the best air purifier for 2019? Modern Castle answers! The simplicity of the H132 means that it really doesn’t come with a lot of accessories or parts. There’s no fancy bells-and-whistles like wifi connectivity, a remote control, or advanced attachments. All of the features are accessible from touch control at the top of the air purifier. The features of the Levoit H132 include basic air purification with a nice simple aesthetic. 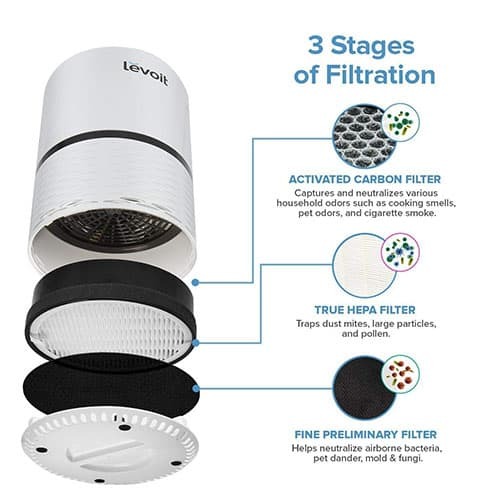 The Levoit LV-H132 air purifier has a three-stage filtration, which helps to remove a wide range of particulate and treat other issues like stale smells, smoke fumes, or pet odors. There is also a built-in nightlight (with two brightness settings) that is easily accessible from the top of the purifier. The fan can operate at three different levels for a variation in air flow. For larger spaces or spaces with poorer air quality, use the highest speed setting. For air purifier while you sleep or to maintain already purified air, you can use the lowest fan speed. The compact size of this purifier is likely one of the features that makes this model so popular. It can easily be moved from room to room and can be placed on a tabletop, counter, or right on the floor. Remember though, at max speed, it can still only purify up to 86 square feet so if your space is larger than that, you may need to move it around the space to get the best performance. If you need a purifier that can handle larger spaces you might consider the Rabbit Air MinusA2 (813 sq. ft.), Levoit LV-PUR131 (332 sq. ft.), or Winnix 5500-2 (360 sq. ft.). The overall peformance of this Levoit air purifier was quite good. While it does take longer to provide better air quality, there is no doubt that this system has the ability to remove harmful airborne substances. Our testing consisted of setting up the Levoit in a medium-sized bedroom in my home, taking an initial baseline measurement of the room’s air quality, running the Levoit for 4 hours, and taking a new measurements in order to compare the difference in overall air quality. In order to take these measurements we used the Temtop LKC-1000S+ professional air quality detector. By using this device, we were able to get precise measurements both before and after using the Levoit LV-H132 Air purifier. 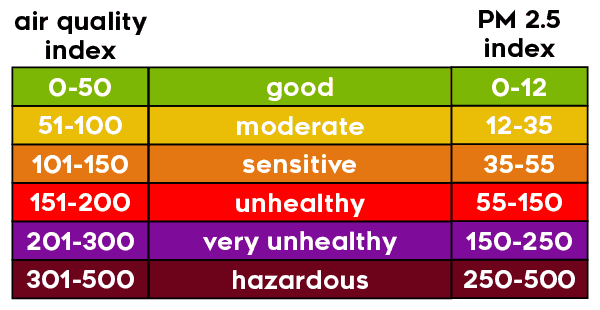 So how was the air quality after our 4 hour test? Given the size and power of this purifier, it does take loner to fully clean the air in the room. However, it does eventually get there. We saw gradual improvements each hour up to the 4 hour mark (where we stopped our test). The biggest limitation of the H132 is simply the room sizes that it’s able to clean. For small and medium sized bedrooms it does a good job, but for large open areas, large bedrooms, kitchens, living rooms, etc. it probably is not going to be a good fit. From a comparison standpoint, the Levoit LV-PUR131 is a more powerful air purifier by Levoit, as it was able to bring the air quality level down to near zero in a single hour. RELATED – Make sure floors and carpets are clean can help further improve air quality. See our best vacuums for 2019 guide for more. The setup of this compact air purifier is straight forward. Concerning its basic nature, the Levoit LV H-132 is user-friendly and intuitive. The buttons on top of the unit are easy to understand and makes it easy to make simple adjustments or change settings. When it comes to using this Levoit, there is not much to it. In fact, setting up the purifier is virtually the same thing as using it. Users can choose a mode on the top of the system that best fits their needs, and from there the Levoit air purifier does the rest of the work on its own. The maintence for the Levoit LV-H132 is not a huge job by any means, but there is a cost associated. This air purifier has three filters, but when it comes time to replace them, they’re actually sold as a set s you don’t need to worry about replacing them individually. Levoit states that the filters are designed to last about 6 months. If you were to use this air purifier 24 hours a day, 7 days a week, then it would cost about $30-40 / year. You can find Levoit H132 replacement filters here. How loud is the Levoit LV-H132? The Levoit LV-H132 does have three different fan speed setting, with each setting producing a slight variation in the amount of noise it creates. 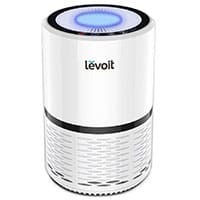 Is the Levoit LV-H132 Air Purifier a good value? All things considered, the Levoit LV-H132 is a solid value. Is the the absolute best purifier on the market? No, but for the price you pay you still get solid air cleaning performance (albeit, for a small area). While testing, we saw Levoit LV-H132 provide a better level of air quality in our home within one hour, but the air quality only continued to improve as we let it run. It may not work as fast as some of the larger air purifiers, but it certainly gets the job done over time. If you’re going to use the H132 is a small bedroom, it’s perfect. However, we would not recommend it for larger spaces. Room Coverage ~86 sq. ft.
Who Should Buy the Levoit LV-H132 Purifier? The Levoit LV-H132 certainly has its pros and cons, but overall it’s a solid choice. Have a small space: The LV-H132 is only spec’d to handle rooms up to around 86 sq. ft. If you have a small space, it works great, but we wouldn’t recommend it for much larger than that. If you have a larger space consider the Levoit LV-PUR131 or see other air purifiers we’ve tested here. Want a good value: If you’re looking for something that has a lower price tag, but gets the job done and looks good doing it, the Levoit LV H-132 could certainly be a good option. Want an easy to use air purifier: The basic design of the Levoit makes it extremely easy to understand and use. The touch controls are intuitive and its lack of bells-and-whistles actually makes it really easy to know how to operate it. Simply plug it in, select a speed, and you’re done. For more information or to buy the Levoit LV-H132 click here. Why did the Levoit LV-H132 air purifier score the way it did? Design – Simple and intutive design. 3-stage filtration is a nice extra, especially at this price point. Performance – Can only really handle small rooms, but as long as it is a small space it does well. Removed around 93% of the particles in 4 hours. Quality – Plastic construction and fairly standard filters, but seems well made. Usability – Intuitive, simple and easy. No smartphone control or rmeote control, but at this price we don’t really expect that. Value – Again, it’s not the absolute best performer, but it does what it is designed to do and does it inexpensively. The Levoit LV-H132 is an inexpensive and simply designed air purifier designed for small spaces. It can effectively clean rooms up to 86 sq. ft. While it’s not the fastest or most powerful purifier, it does get the job done eventually. Basic design and construction, but it’s ideal for small rooms to “set and forget” (at least up to 6 months at a time). Good value overall. How big was the medium sized room you tested this model in? I have an 120sq ft bedroom and currently own the LVH132. I’m pretty impressed by your results and want to know if my room size isn’t too much of an overkill for this compact unit. The room we tested in is 144 sq. ft.
It’s a 12′ x 12′ with 8′ ceilings.